The Landreths harbor a family of fugitive slaves. The family fears the oncoming civil war and the possibility of sending fathers and sons, brothers and cousins off to fight. Rupert, Cyril, and Donald Keith, Wallace and Stuart Ormsby, and young Percy Landreth are eager to defend the Union they revere and love, but they are also anxious to return to family and friends at home. 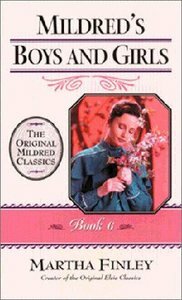 About "Mildred's Boys and Girls (#06 in Mildred Keith Series)"
Martha Finley (1828 - 1909) was a remarkable woman whose quiet Christian life has influenced many. A teacher by profession, her writing career began with Sunday school stories for children. In 1868, her novel Elsie Dinsmore was published and became the publisher's best-selling book that year, spawning a series that sold millions of copies at home and abroad. The Millie books were a follow-up to that series.- Publisher.